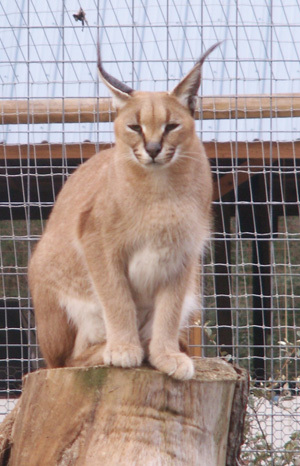 Felis caracal, Caracal adults average 25 to 40 pounds, though some males can reach 50 or more pounds. 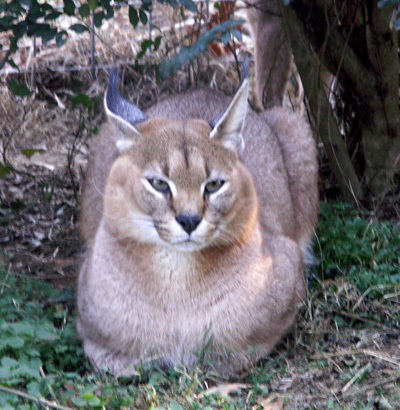 It is common for caracals to be food aggressive and this contributes to over-feeding and obesity. 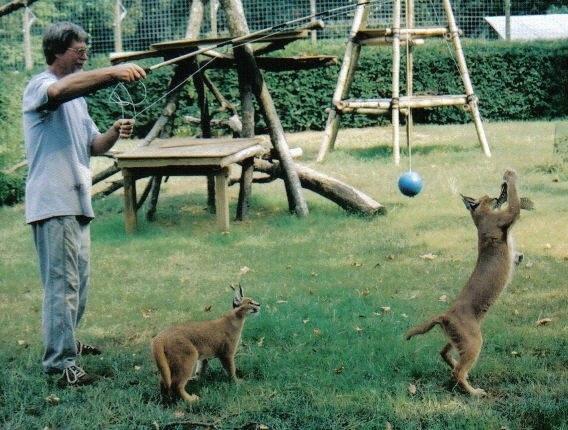 Provide a quite place to feed your caracal and if it cohabitates with other felines, separate them for feeding time. 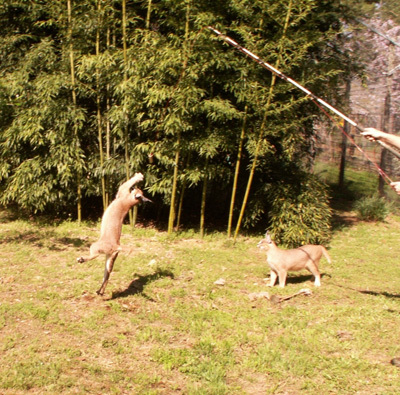 Caracals are excellent jumpers, and have very swift reactions. They are intelligent creatures. 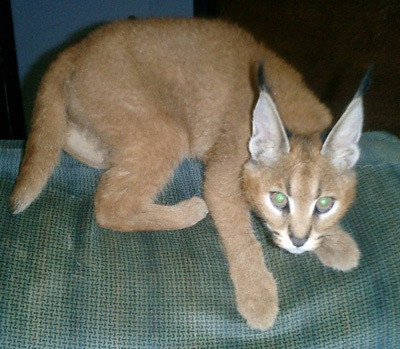 Caracals can purr, but often times it is very soft. An owner can feel a purr on the neck, rather than hear it. 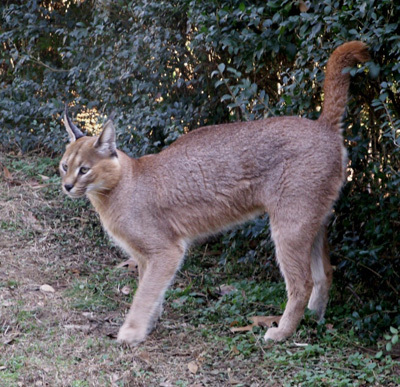 A happy caracal will express joy by vocalizing a ‘trill’ a bird-like sound that denotes a happy greeting. 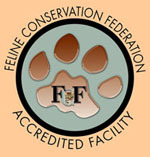 Caracals reliably respond to a human imitation of this sound. They will come out of hiding, or relax when they are apprehensive, intimidated, or insecure. 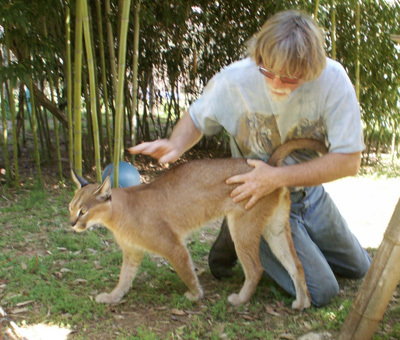 Caracals are more predatory than the similar sized African serval. In Africa they have evolved to hunt larger prey such as dik-dik and other small antelope. Caracals are also guilty of killing the young of domestic livestock making them nuisance animals to the South African ranchers. Like servals and other wild feline species, both male and female caracals will scent mark. 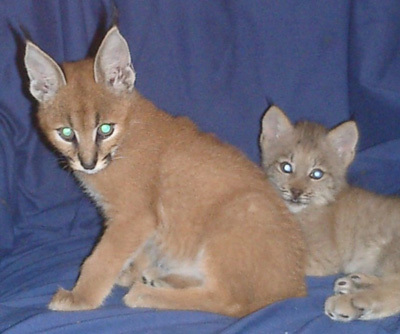 Additionally, caracals have a tendency to void on fluffy surfaces, such as down quilts, pillows, or clothing left on the floor. This behavior can be dealt with by always picking up dirty laundry, and litter box training the feline.